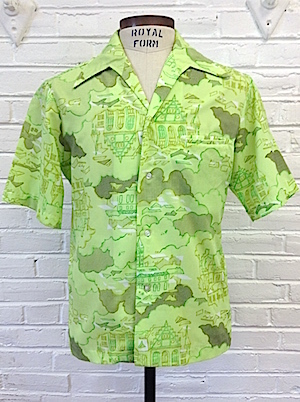 Home > Men's Vintage Shirts > Hawaiian Shirts > (M) Vintage Mens 70s Hawaiian Shirt! Bright Green w/ Fancy Buildings in the Clouds! Classic vintage 70s mens Hawaiian shirt! 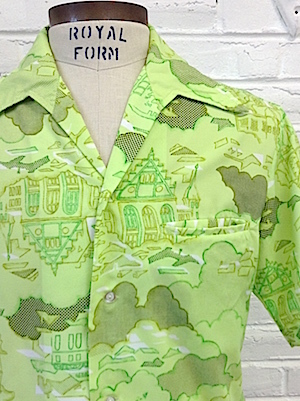 This amazing Hawaiian shirt has a bright green base with line drawings of fancy house in the clouds. Clouds and houses are made with lines and dots in darker shades of green and brown. Closes in the front with pearly white buttons. Has an extra wide 70s collar. Has one chest pockets and a straight hem. Tagged Made in Hawaii. 100% polyester.